Contact - Website of kennelextol! Let me introduce myself, my name is Ida Lindh. I was born in Ängelholm where I grew up and have had dogs all my life. My parents have always had Labradors, but when the choice was up to me I choose a Portuguese water dog. My first PWD arrived in March 2009. Right now I live in Ängelholm, close to the beach in the southern part of Sweden. I do everything together with my dogs. We're practicing obedience, tracking and field trail together and we love to spend time in the nature. My hobby is also dogshows and handling. 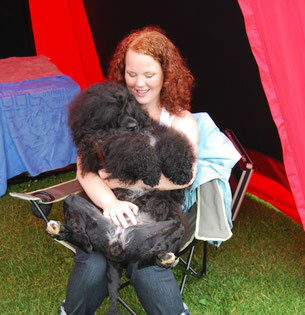 The Swedish Breedclub for Portuguese Water Dogs.